I'm a silly human, so sometimes I like to force new things onto the cat, with the hopes that she will actually take joy from the new thing and add it to her daily routine. I'm silly, because clearly the cat only wants to play with what the cat wants to play with, when the cat wants to play with it! Pesky human meddling in her life! Geez! Gary: Seriously, you want me to do what? 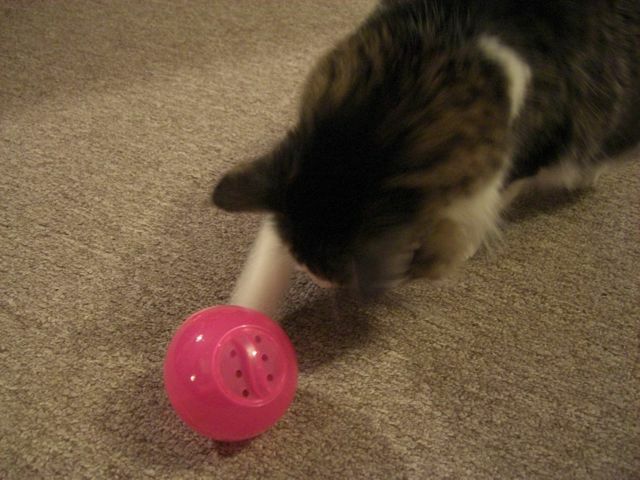 I was at Dollarama yesterday and I saw this activity toy for cats. 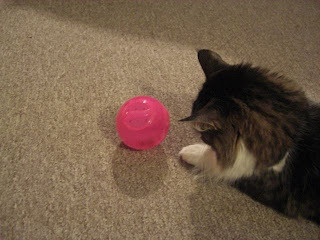 Treats get locked into a ball that has treat sized holes, and the cat is supposed to play with the ball until the treats fall out. They generally fall out one at a time for extended play. Sounds simple right? 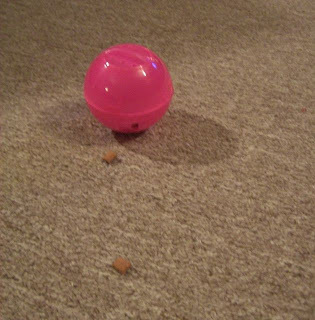 Treats that have fallen out of the ball. 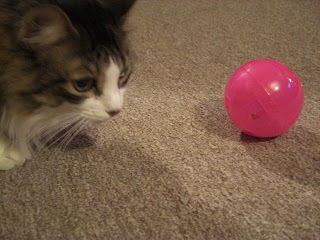 I encouraged Gary to play with the ball. I pushed it in front of her. Nothing. 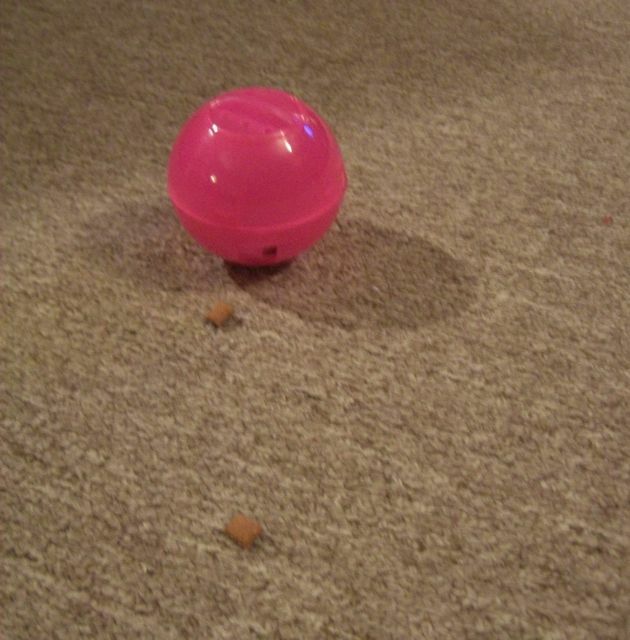 I shook it to indicate it contained treats. No dice. As she got more and more annoyed, she glared at me like I was a stupid human jerk. Gary: I don't care about this. Gary: Seriously!! Just give me the treats already. I was not giving up! 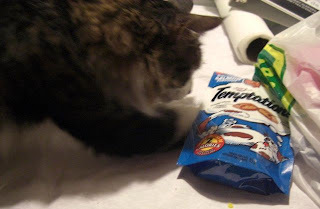 I was going to force the cat to have fun, whether she liked it or not! For the most part I just pushed around the ball until the treats came out. 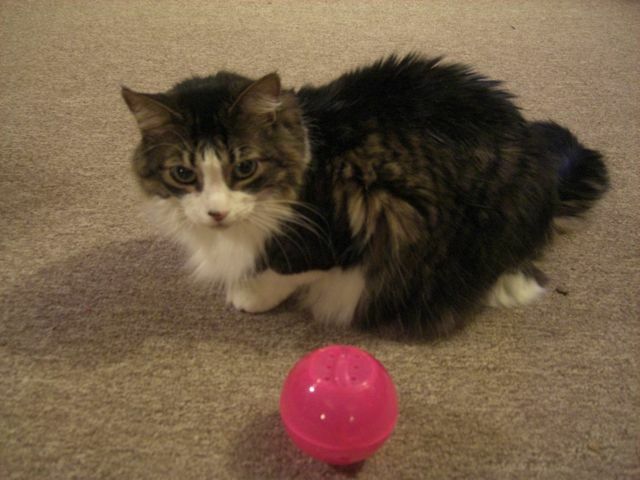 Gary ate the treats and caught on to the idea that the treats and the ball were somehow related. She had no desire to push the ball, though; that was something a silly human would want her to do. Periodically she would sniff at the ball, but it only made her angrier. 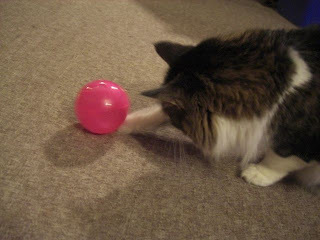 I continued to push the ball around and more treats would fall out. Gary would eat the treats and then resume her frustration. Finally she put two and two together. Gary: Something better frickin' happen! A little later Gary decided that there was a much better way to get at the treats. 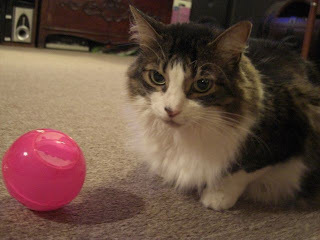 Leave the ball and the human out of it altogether! Gary is a little smartie, but she was SUPER ANGRY while she was learning. I felt bad for her; she was trying so hard! Learning is hard.